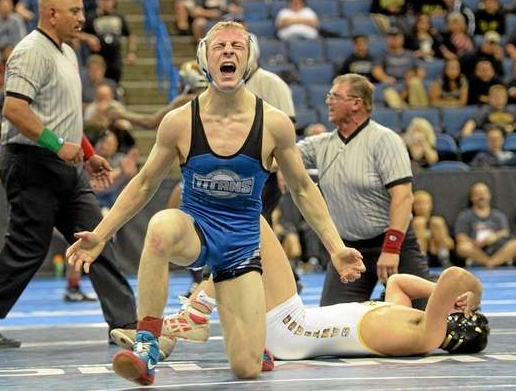 ONTARIO — San Marino High School had big expectations entering the 2015 wrestling season. The Titans lived up to that billing Saturday. San Marino, a few years removed from being the doormat in the Rio Hondo League, is the best in Southern California after taking the CIF-Southern Section Masters title in dominating fashion at Citizen’s Business Bank Arena. The Titans, led by two-time Masters champion Zander Wick (145 pounds) scored four individual championships and had six qualifiers to the CIF State championships en route to a first-place finish, St. John Bosco was second with Northview third. The Titans and Vikings each qualified six competitors to next weekend’s state championships, scheduled for Rabobank Arena in Bakersfield. The other individual champions for San Marino were Zander Silva (113), Julian Flores (132) and Luke Troy (152). “We did really well,” said Wick, who won at 126 last season. “It was awesome. It’s amazing, because three years ago we weren’t even league champions, we were like last in our league. We got good coaches to come in and we got a lot better. The rest of the area had a pretty solid day as well, with six champions. The other two were Northview’s Richie Casillas (120) and Ricky Padilla (160). The area qualified 21 to next week’s state championships. The other area qualifiers were Montebello’s Nico Gomez (103, fifth); Bishop Amat’s Eddie Flores (103, seventh) and Nigel Ruiz (145, fourth); San Dimas’ David Gonzalez (113, second); Sonora’s Russell Rohlfing (126, third) and Josh Kawaguchi (132, second); Northview’s Andres Hooper (126, sixth), Andres Estrada (132, fourth), Joe Dominguez (145, third) and Roger Arce (170, fifth); California’s Richard Pocock (132, fifth); San Marino’s Evan Wick (138, second) and Aaron Padilla (160, third); Charter Oak’s Antonio Zavala (152, seventh) and Damien’s Patrick Sanchez (285). Zander Wick was one of two from the area to repeat as Master champions. He was joined by Padilla, who won at 152 last season. Wick, ranked No. 3 in the state, beat No. 2 Jeremy Thomas, of Corona Santiago, 7-2. He led 3-2 late getting a takedown and near-fall to win by 5. Padilla was steady in beating Hemet’s Caleb Wilson, 3-0. It was mission accomplished for Arroyo High School’s Jackie Quinones Saturday. The senior had a season-long of goal of winning CIF-Southern Section and CIF state wrestling titles this season. She accomplished the former two weeks ago and finished off the aspiration by winning at 189 pounds at the CIF State championships at Visalia Convention Center. Quinones’ title quest was the area highlight, which also included Northview finishing second for the second consecutive season. The Vikings, who won a state title in 2013, had three competitors score a top-eight medal. They were Izzy Valles (137, second), Deidra Valles (150, fifth) and Azusenna Molina (170, second). The area had 10 athletes win medals. The others were Walnut’s Alyssa Barredo (101, second) and Mia Dow (121, fourth); California’s Nadia Escamilla (111, sixth); West Covina’s Jennifer Lopez (116, seventh); Arroyo’s Lesly Ramirez (150, sixth) and San Dimas’ Daishea Jaime (121, second). No. 3 Maranatha (18-4-4) at No. 2 Paloma Valley (13-7-4), 5 p.m. The sophomore goalkeeper stopped the seventh penalty shot to give the Musketeers a quarterfinal victory over host Arcadia. 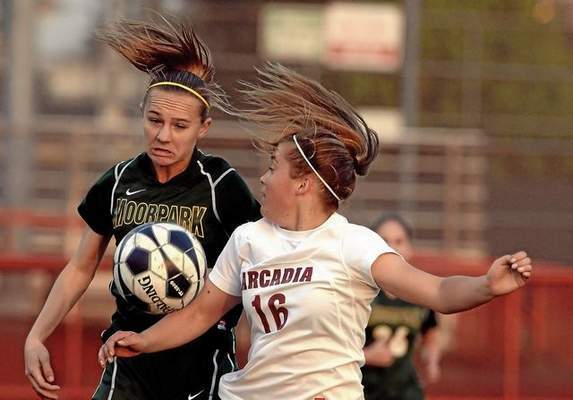 She guessed correctly to go to the left and stopped Kaylin Pascasio’s shot to give Moorpark (14-6-3) the decisive penalty kick goal, 4-3, on Thursday evening. The teams were tied, 1-1, after regulation and the two 10-minute golden-goal overtime periods. Arcadia 17, Glendale 1 — Teams of Brian Kim and Stanley Lim and Henry Zhang and Kevin Yang swept in doubles to lead the Apaches (2-0, 2-0) to a Pacific League victory. Keppel 10, Maranatha 8 — Matt Alleman and Daniel Hsieh swept in singles and the teams of Eric Law and Andy Xiang and Bryan Chan and Timothy Wang swept in doubles to lead the Aztecs (2-0) to the nonleague win. University 12, San Marino 6 — Derek Chen swept in singles for the Titans (0-1) but it was not enough in the nonleague loss.